Rug repairs are a great way to get your rug looking 100% perfect again. Replacing a rug can not only be costly, but a new rug may also be significantly different from the one you currently have. Professional rug repair is a great option to get your rug looking like new while saving you time and money. When choosing a rug repair company, you want to pick one that is trusted and has years of experience. KIWI Services in Combine has 30 years of rug repair experiences and we have over half a million customers we have left happy with our services. If you are looking to bring your rug back to life with professional rug repair, then look no further than KIWI Services. KIWI’s rug repair services are the best in Combine. Our rug repair team is unmatched. Our team consists of a senior rug expert, a master rug weaver, and a fringe surging and binding specialist as well as professionally trained rug repair technicians. Our rug repair team can work on numerous rugs. KIWI Services is dedicated to making sure our customers are 100% happy with their rug repair experience. From the first call until we deliver your rug back to you, KIWI’s representatives and technicians are available to help you in any way we can. 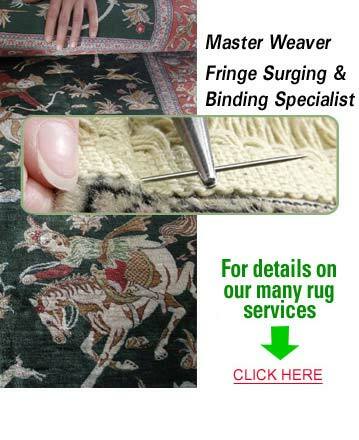 We offer free pick-up and delivery on all of the rugs we service and we also offer a one-year rug repair guarantee. If you should run into any issues with your rug repairs, give us a call and we will perform a complimentary re-do.